This very handsome church was designed by Cram, Goodhue & Ferguson and completed in 1911 and was built by the South Reformed Church, a Dutch Reformed congregation that was founded in 1693. 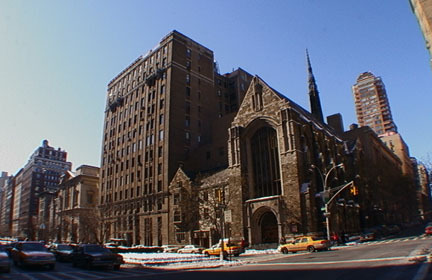 This gray-stone building subsequently became the Park Avenue Presbyterian Church in 1914 and then was acquired in 1945 by the Christian Church (Disciples of Christ). Louis Comfort Tiffany designed the large window facing Park Avenue. "Abruptly vertical, this Gothic church has been compared to the Sainte-Chapelle in Paris because of its proportions and its slender 70-foot spire, known as a fleche," noted David W. Dunlap in his fine book, "Glory in Gotham, Manhattan's Houses of Worship, A Guide to Their History, Architecture and Legacy," a City & Country Guide published in 2001 (see The City Review article).